For the Spring a Fun Pond Pack! This is going a be a favorite at our house for a while. This Pond Pack was made for kids 2 to 8. It was made to go with the book Jump, Frog, Jump! . This is a great book if you have not read it. It has great progressing and repeat words. You are going to find lots of activities for the book and some general pond activities as well. Plus some frog life cycle activities also. We have had some fun with this over the past few days. 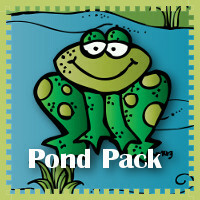 Check here to download the Pond Pack! Check out the Additional Pond Ideas on my Pinterest Board. This entry was posted in printable pack and tagged frog, pond, printables. Bookmark the permalink. 31 Responses to Free Pond Pack! What a great packet of activities! My students loved that book when I taught first. Thank you for sharing! So awesome! I can’t wait to do a few of these activities with my preschooler. 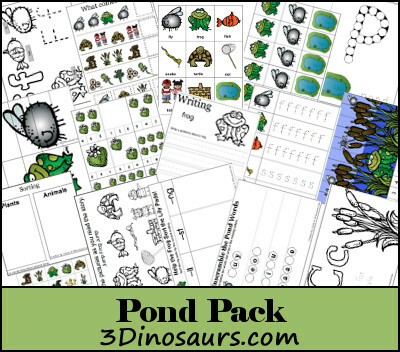 Pingback: FREE Pond Printable Pack ! I LOVE your pond pack!!! Thank you so much!!! “Our” summer school the day after Memorial Day and my 2 kiddies can’t wait to do it!! It is always fun to have something they look forward to doing! Thanks so much for sharing! My class will have a great time with these activities next week!! Thank you so much! I am making Jump, Frog, Jump take-home packs for my kiddos. The activities you have are perfect for families to do together!